You know, that part of the meal when you've finished the "healthy" stuff, the stuff you HAVE to eat, but now it's time to have that fantastic little extra that makes you close your eyes and moan in sweet culinary delight. Now, this could be as simple as grabbing a chocolate chip cookie out of the pantry. But been there, done that, right? So cliche. No, sometimes we need to DARE to be different. Dare to do go beyond the normal and have a knock-out, fabulous dessert. I mean, if you're going to have the calories... might as well make them worth it, right? Our books can be like that. We have a great main plot, some interesting characters. The book is shaping up well. But what separates a good book from a GREAT book is those who dare to think outside the normal bounds, who add that extra splash that makes the reader's eyes burn to eat... I mean read... more. This can be different for everyone. It could be a "WOW, didn't see that coming" plot twist. A unique angle on your character that just takes them to a new dimension.Or a surprise subplot that adds flavor and depth to your main plot. Or it could be like dessert... it could be a total, satisfying, unforeseen ending that takes the readers breath away. What about you? Can you look at your work in progress and find something that is just "okay" or "good enough" and dare to go beyond your normal, to add a twist that leaves people breathless and wanting seconds, regardless of calorie count? I don't know about you all but that's always my aim when I cook... AND when I write. 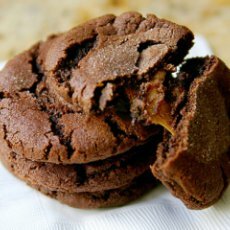 Because seriously, you can't get much more daring than making CHOCOLATE CARAMEL FILLED SUGAR COOKIES. Beat 1 cup of butter until nice and creamy. Slowly beat in 1 cup of white sugar and 1 cup of packed brown sugar. Then beat in 2 eggs and 2 teaspoons of vanilla. In a smaller bowl, stir together 2 1/4 cups flour, 1 teaspoon baking soda, and 3/4 cup of unsweetened cocoa powder. Cover and chill for 2-3 hours. Preheat oven your to 375 degrees. Divide the dough into 4 parts. Put 3 parts back into the fridge, otherwise they will be IMPOSSIBLE to work with. Divide the part you're working on into 12 pieces. Press each piece of dough around a chocolate covered caramel (I use Rollo's). Place sugar side up, 2 inches apart on greased baking sheets. Bake for 8 minutes in the preheated oven. Repeat with other 3 sections for plenty of yumminess to go around!